Both the ways of watching a film have advantages and disadvantages. 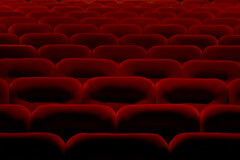 The biggest difference between watching a movie at home or at the cinema is the level of enjoyment. The special effects in a film benefit from being shown on the silver screen. Everything is bigger, the sound is louder and one also gets into that groovy mood when you come into a cinema. The differences can be so big that a film can be a hit at the cinema, but a total drag if watched in a video format (Triple X…anyone?). Sometimes it can be very nice to get out of the house and do something among other people and not just sit at home and feel lonely. Then the cinema is a very good choice. And when on a date it is much more romantic to go to the cinema instead of watching a video. Going to the cinema has one big disadvantage though—the price! It is very expensive to watch a film at the cinema. Actually, one can rent two videos and buy sweets for the same price as watching one film at the cinema. When you watch a video at home it is possible to take a pause whenever you need to. That is not possible at the cinema. The luxury of being able to stretch the legs or eat food or do other things at the same time is also priceless. Even exercise! If the need to talk friends should emerge during the film then it is okay to do so without disturbing other people. Then if, a part of the film is missed for some reason it is possible to rewind and re-watch the part. Many times at the cinema the volume can be too loud. When watching a video one does not need to worry about that because the remote is right there. And if the movie is great one can watch it over and over again. Of that is possible at the cinema too but then it would be very expensive. And maybe they do not even show the film as many times before it is replaced by a new one. My opinion is that I both like going to the cinema and watching videos. The experiences are so different that one cannot even compare them. But sometimes it can be as nice to sit at home and relax with a cup of tea watching a good video film as to watch a film at the cinema. And as I am a poor student, I like the price of renting a video film much better.